Is it possible to be bored at the beach? I suppose, but here on the Central Coast, with all the fun activities available, it would be very difficult. Here is page 3 of "Fun at the Beach", sometimes known as "What to do at the Beach?" or the "Best Things to do at the Beach". By any name, you can see that there is a great range of beach activities that are fun and engaging. Infants love the beach. So much to experience and new things to see and hear and smell and touch. Before we ever started building sandcastles, or wading in the surf, the first beach activity we probably engaged in was picking things up out of the sand. And even now, so many years later, we still pick up interesting objects and wonder about them. There is great beauty and intricacy in sea shells. Most of the shells found on the beach are from mollusks which includes clams and snails. 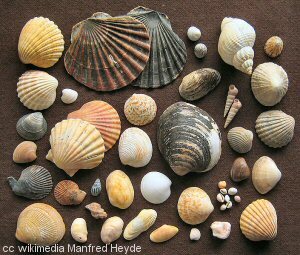 There are thousands of species, all with a unique sort of shell. Some beaches are better than others for particular types of shell, or shells altogether. Other variables might include the time of year. After a storm might be another good time for shell collecting as the activity of the waves tends to stir things up. If you're willing to work just a little, you might find something very interesting down in the sand. 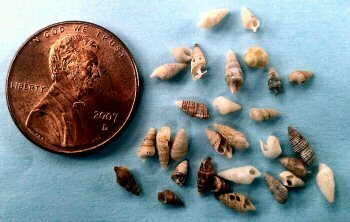 Miniature sea shells - also called micromollusks - are little known and not frequently collected since they are quite easy to pass by. My sister has collected many of these from Central Coast beaches and the color and variety - and smallness - are captivating. You can see how small the tiny shells are in her picture. She has collected these on various beaches throughout Central California - Spooner Cove at Montana de Oro State Park and Lover's Cove in Pacific Grove. Sea glass, or beach glass, is essentially trash that has been transformed by sea water and the abrasive quality of sand in the waves. So from sharp and nasty bits (or larger chunks) of glass or porcelain, beautiful sea glass emerges from the ocean. 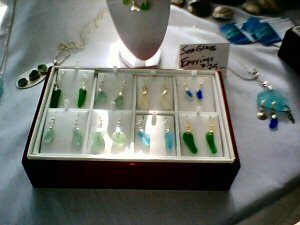 There are as many colors of sea glass as there are colors of the original pieces. Green and white are the most common. Here is a page with a beautiful picture of red sea glass and some information about sea glass festivals on the central coast. It's quite an interesting hobby and seeing all the many decorative things that can be made from sea glass is quite fascinating. Jade can be found and collected (regulations page) along a section of the Big Sur coast and it is quite beautiful. Some of the pieces found are quite large. Each year there is a Big Sur Jade Festival. In 2012 it will be held the weekend of October 5-7. 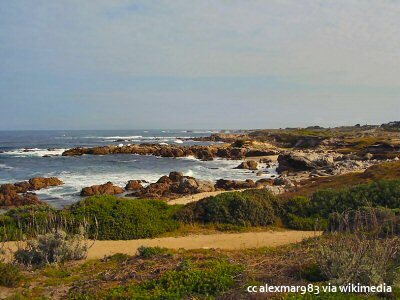 At the southern end of Big Sur there is a section of beach called "Jade Cove" (Highway 1 mile marker Mon 13.3). There are many colors in which Big Sur jade comes, the most common being the characteristic green. If you think you've found some jade, try scratching it with a knife. It it scratches, it's not jade. You probably won't get rich prospecting for jade, but it can be fun. Surfing is not a sedate activity, and it takes practice, but what better place than California to make your fantasy a reality? There are a number of surf shops in San Luis Obispo and Monterey Counties and most of them rent boards and wetsuits (yes, our water here is cold) and give lessons. 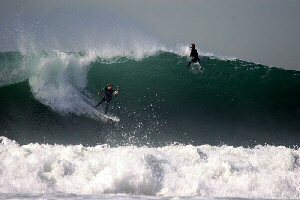 If you want to learn how to surf, I highly recommend this web site that has first-rate information to get you started. There is also a list of surf shops in Central California here. This surfing site is a great resource whether you are a veteran surfer or new to the sport. I'm not afraid of the water or the ocean; my father taught me to respect it, but not fear it. I am a good swimmer. I have often swum in the ocean and snorkeled and body surfed. 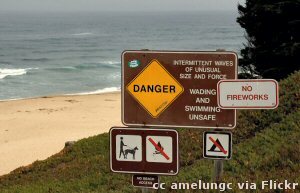 And there aren't many places along the Central coast of California where I feel comfortable swimming in the ocean. 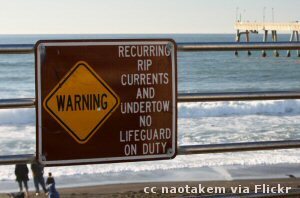 If you're a strong swimmer and understand rip currents and undertows and how to free yourself from them - then you can make a choice about swimming in the ocean or not. If the above description doesn't apply to you - well, heed the signs and take them seriously. Remember, this page is about "FUN" at the beach, and being slammed into the sand (or worse, rocks) by a rogue wave or being dragged out to sea by a rip current isn't fun. 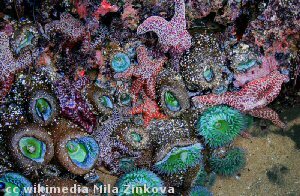 There is an amazing wealth of sea life that has its home in the area between the high and low tides especially in rocky areas of the beach. These sea creatures are quite hardy since they have to survive the dramatic alternation of wet and dry several times each day. But they have adapted to this environment and make their livings in this transition or intertidal zone. Have a good time - fun at the beach, remember?